The Times has today published a fine piece on applying for pupillage, reflecting the advice and experience of some survivors of the process, both applicants and interviewers. Having had the privilege of seeing life from both sides of the interview table, I thought I’d offer my own, largely worthless musings on the things I have learned. 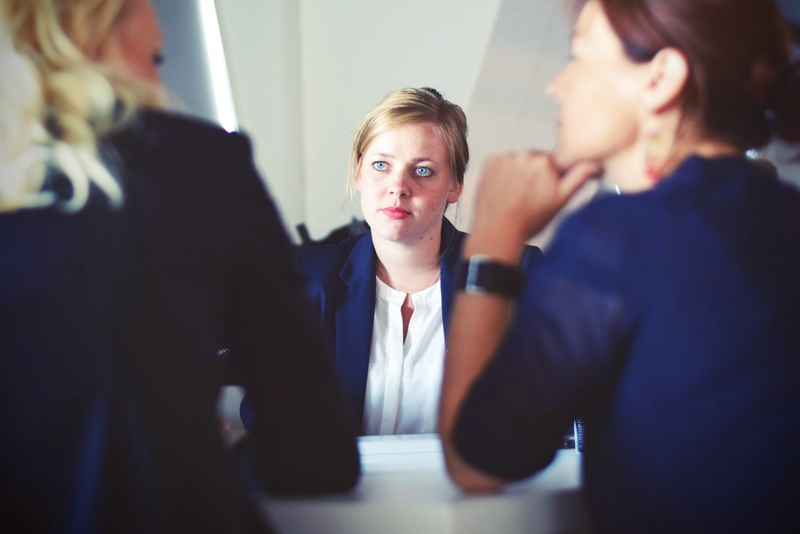 A stock photo entitled “three women in suit sitting” which could also feasibly depict an interview. Have a good answer to the inevitable. You will be asked why you want to be a barrister. You will be giving a variant of an answer the panel has heard a thousand times before. That is unavoidable. So don’t strain yourself stretching for originality; aim for simple honest sincerity. At my first ever interview, I span a fluffy cat story about how I was inspired by the story of somebody I met on a mini-pupillage, and how I aspired to tread in their footsteps. The disdain from the panel was palpable. For several interviews thereafter, I cleared my throat and proudly declared my thirst for justice, passion for advocacy and burning need to help the helpless, voice the voiceless and improve the unimprovable. Looking back, I was fortunate not to have a chair thrown at me. Forget cliché and invention and speak plainly. If I were transported back and asked once again why I want to be a barrister, my answer would be simple: because I want to do something exciting with my life. And at the criminal Bar, whatever brickbats we throw at the system and the punitive lifestyle the Bar engenders, life is never, ever dull. Why did you apply to this chambers in particular? 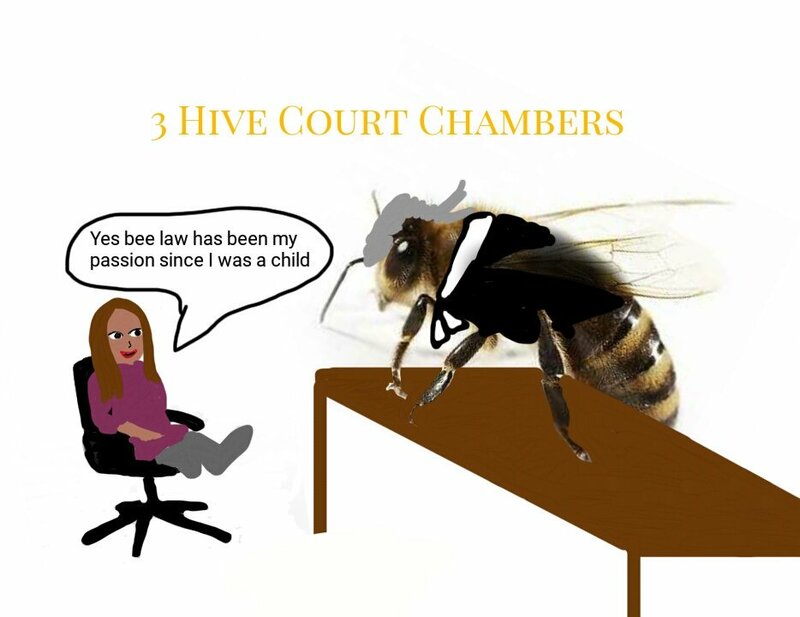 For the most part, the truthful answer will be: “Because you are a chambers, any chambers, and I would literally accept a pupillage in a chambers run by bees at this moment in time.” Again, it’s a nasty question that interviewers know is near-impossible to answer. If you’ve done a mini-pupillage at that chambers, that will help formulate a complimentary response. If not, scour the chambers website for self-congratulatory guff about “ethos” and “values” and try to pass those off as your own. Failing that, tickling the ego of your interviewers with a non-grovelly acknowledgment that the chambers is a “leading set” (all sets like to consider themselves leading) in the particular area of practice is a reasonably safe line. The blunt fact is that everybody being interviewed will have a good 2:1 or 1st class degree. Many will have Master’s degrees. All will have (or will shortly have) at least a Very Competent mark on the BPTC. All will have done debating, mooting and other forms of public speaking. Presidents of University Law Societies are ten-a-penny. The well-advised will also have squeezed some pro bono legal advisory work into their non-existent free time. These are all necessary but insufficient. None, I’m afraid, will stand you out in the memory of the panel. However, the fact that you are a decorated Morris dancer, or were thrashed by Daphne and co on Eggheads, or once interviewed Mike Tyson for your student newspaper with the opener (and closer), “For our readers who may not have heard of you, what do you do?” – these will remain with the panel afterwards. They show that you are human, intriguing and the kind of person that the interviewer actively wants to find out more about. And that is the very best impression you can leave. Linked to the foregoing, make sure you have prepared to talk about something – anything – that is not law. There will be a lot of law chat. But there will almost always be a tangential diversion into matters of non-law, often preceded by a vicious, “Tell us more about yourself”. One interview I attended was even more brutal; we were given five minutes to think up a 2-minute presentation on a topic of your choice. Line up a few of these during your interview prep. Think of something non-legal (to demonstrate your glorious diversity) on which you have personal experience or strongly-held views, and have it wrapped up and ready to fire in the event it is called upon. Again, an interview staple. Read the newspapers. Gobble up Times Law, Legal Cheek, Legal Twitter, and blogs by proper lawyers and academics for hot takes on vexed issues of law and politics. A common interview trick is to ask you to argue one side of a debate, before immediately inviting you to argue the opposite. Draw up a list of likely topics and think about your arguments in advance. Also be aware of industry-specific issues that are of no interest to anybody outside the Bar, but of enormous importance inside our bubble. If you’re interviewing for a criminal pupillage, be prepared to answer, “What are the biggest challenges facing the criminal Bar?” Be opinionated without being obnoxious; political without being partisan. Stand your ground under pressure from smug interviewers, but be prepared to make concessions if your argument is expertly blown apart. Don’t be intimidated by chambers profiles. Looking at the profiles of other junior tenants on the chambers website can be a sobering experience. You will read how your contemporaries spent a year as an intern on an international human rights case, or have written starry and brilliant articles, theses or even books on esoteric and impressively complex aspects of your chosen legal field. Many will have impressive previous careers, either in law or outside, and as a twenty-something BPTC graduate, it is easy to be gripped by inferiority. Don’t be. Your CV counts for absolutely nothing when you’re sitting in a cell opposite a screaming heroin addict who has stabbed his cellmate in the eye and is threatening to exact upon you his frustration that his solicitor hasn’t been to visit him. Nor does it matter a jot when you’re in front of a judge or jury pleading the unwinnable case (or worse, the eminently winnable). Your judgment and powers of advocacy are the skills that can’t be reflected on pornographic CVs, and are the ones that matter most. Practise on demonstrating those in interview. It sounds obvious, but nerves in interview upend the most poised performers in your advocacy classes. Your interview is a chance for you to demonstrate advocacy under pressure. Deep breaths, slow and considered responses and substituting a brief pause for “umm” or “err” or, heaven forfend, “like”, are mandatory habits. Even if the topic is your Mastermind subject, you win no points for speed. Some chambers do things the old-fashioned way. China tea-pot, warm smiles, civil conversation. Some take a sadistic pleasure in setting you Total Wipeout style obstacle courses at a second’s notice. Impromptu presentations on random subjects; a Dragon’s Den pitch on something I had two minutes to invent; idiotic Oxbridge-interview questions (“If you were a banana, what car would you drive?” etc); deliberately confusing written exercises and needlessly aggressive interview styles were, and probably still are, all common features. In reality, “prepare for the unexpected” is fairly useless advice; the best antidote for this kind of stuff is experience. But try not to be fazed. You will hear competing theories over whether you do in fact need to have a prepared response to the final, dreaded, “Do you have anything you’d like to ask us?” My advice is to have at least three questions in your back pocket (just in case the panel unhelpfully answer one or two of them in the course of the interview). Even if it’s something as simple as, “Roughly how long does it take for your junior tenants to start appearing regularly in the Crown Court?” If you really can’t think of a good question, don’t ask a bad one. But it shouldn’t be beyond your wit to come up with a couple, just to keep the conversation flowing. Oh, and under no circumstances ask, “Did I get the job?! LOLZ!” You will deserve everything you get. This, I’m afraid, is the reality. The pupillage statistics speak for themselves. Your odds are slim, and unless you are particularly brilliant (and most of us aren’t), you are competing against hundreds of people of comparable ability, intellect and experience. What separates you from the herd in the eyes of the interviewers is often wholly arbitrary and unexpected. I was lucky enough that a flippant topic I’d picked up on was of enormous interest to a wonderfully fun and quirky member of chambers on the panel, who quickly turned the conversation round to 1980s power ballads. That, I was later told, was the clincher. Others will have friends or family in chambers, or relatives in the judiciary. Nepotism and inherited privilege shouldn’t have their place at the modern Bar, but they linger. There are a million variables that may influence your chances in any given interview. Ask for feedback from unsuccessful interviews, and use anything constructive, but don’t let a run of rejections cause you to lose heart. All it takes to break a losing streak is just one lucky win.